Body Champ Power Tower Review – Nice Body, Champ! Nice body, champ! That’s what people will say after you’ve been doing good quality bodyweight workouts for a while. 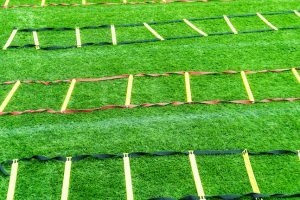 Push ups, pull ups, dips and leg raises are up there with the best bodyweight exercises, however if you want to do them at home then you’re going to need the right piece of equipment. Power towers are popular options for doing bodyweight workouts because they’re relatively cheap and easy to use to get a great upper body and core workout. But, not all power towers are made equal, and if you make a poor choice when you buy one then you’ll simply end up with a hunk of metal that cost you money, time and effort, and which gives nothing back. Hopefully we can help you avoid that. Ok, now let’s get into the detailed review! 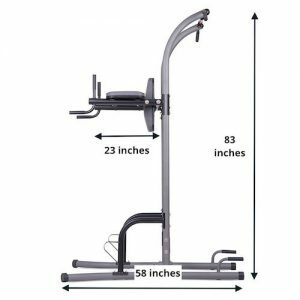 The Body Champ Power Tower is another entry-level bodyweight station that usually sits in the $100 – $200 price range, and is intended for home use by people who want to do standard pushing and pulling bodyweight exercises. In that regard, the Body Champ is not too different from a number of other power towers we’ve reviewed (e.g., Weider Power Tower, Xmark XM-4434, Soozier Fitness Power Tower). And like those other power towers, the Body Champ Power Tower requires quite a lot of space to use comfortably. It’s footprint is approximately 46.5 inches wide (3’10 ft; 118 cm), 58 inches long (4’10 ft; 147 cm) and 83 inches tall (6’11 ft; 210 cm). As such, you’ll need a fair amount of room in which to assemble and use it. The pull up bar allows for a variety of pull ups and chin ups, and all of them will primarily work your latissimus dorsi (lats) and biceps and, to a lesser extent, your trapezius, posterior deltoids, abdominals, and pectoralis muscles (pecs). Varying the width of your grip between wide and narrow on the pull up bar will change which muscles are most worked (for example, narrow-grip pull ups work the upper part of the lats more intensely than wide-grip pull ups). The pull up bar can also be used to do hanging leg raises, which are good for an intense abdominal workout. The dip station will help you work your pecs, anterior deltoids and triceps. 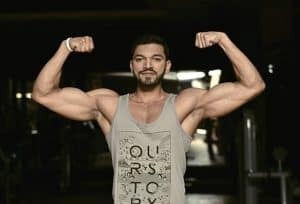 Again, modifying the angle of your body when doing dips will also change the extent to which the various muscles are worked. 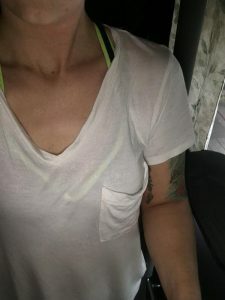 The more you bend your torso forward, the more your pecs will be worked. A more upright torso works the triceps more intensely. The padded back and arm rests in the vertical knee raise (VKR) station can be used to do back-assisted vertical leg and knee raises, which will work your abdominal muscles. The platforms below the dip bars will help you get into the leg raise station, and can also be used for calf-raises. Also, if you’re able to support your bodyweight with your arms, you can use the dip bars to do unassisted vertical leg / knee raises, which will provide a more intense abdominal workout (similar to hanging leg / knee raises). The handles below the pull up bar allow you to do platform push ups. When doing platform push ups, you’re able to lower your body below the level of your hands, which works your pecs, deltoids, and triceps more intensely than regular push ups (performed on the floor). The Body Champ utilizes a D-frame base, which is where the base angles outward, as well as double support crossbars between the upright posts. It’s also quite wide, measuring 36 inches across at the base’s widest point, and 24 inches (60 cm) between the dip bars. This reduces the amount of rocking and wobbling you’ll feel during pull ups and dips, a feature made more impressive considering it’s also one of the lightest power towers on the market (64 lbs; 29 kgs). That said, as with all entry-level power towers, a bit of instability, especially during dips, is almost unavoidable. Most people will feel some back and forth movement while using the pull up and dip bars, especially if you weigh 200 lbs (91 kgs) or more. The instability will be made worse if you use uncontrolled form, or do explosive variations of pull ups and dips. For that reason, this power tower is not suitable for doing advanced bodyweight exercises, such as muscle ups and front levers or weighted exercises like weighted dips. While doing controlled bodyweight exercises won’t cause the Body Champ Power Tower to tip over, doing explosive or weighted exercises might. You may find the normal instability to be unsettling and / or annoying, but it’s actually not such a bad thing. It will help you learn to do your bodyweight exercises with a steady and controlled technique. When you can do your bodyweight movements without your power tower rocking or wobbling, you’ll know you have your form just right. 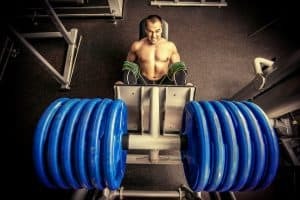 That said, if you’re concerned about instability, you can try placing some protective lightweight home gym flooring beneath the power tower, or weighing the base down with some weight plates and or sandbags. The protective flooring will improve stability and protect your floor from damage. Ultimately, the design of the Body Champ Power Tower is good, and you won’t have any issues with stability if you use it appropriately. It would almost be a 5 star power tower if not for the quality of the materials, which doesn’t quite meet the same standard. Don’t get us wrong, the materials aren’t poor quality but they aren’t great quality either. 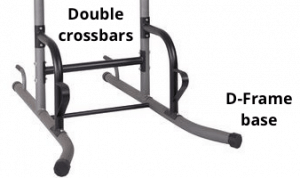 The product description says that its constructed from heavy duty steel (of course), but the frame seems to use a lower gauge steel than a lot of bodyweight equipment. As a result, one of the things we think you’ll notice about this power tower is that it’s light. It weighs in at approximately 64 lbs (29 kgs), making it quite a bit lighter than many of the other popular 4-station power towers (e.g., Weider Power Tower, Soozier Fitness Power Tower, Stamina 1700). As we said, this doesn’t make it bad, but if you’re looking for a really heavy duty piece of equipment; one with a bit of weight to it, then we recommend looking at something like the Stamina 1700 Power Tower. One advantage of having a lighter weight power tower, however, is that it’s very easy to move around. 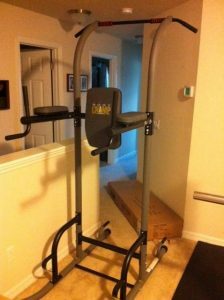 So if space is at a premium in your home workout area, then this power tower can easily be stored in a corner, slid out when you want to use it, and then moved back when you’re finished. A disadvantage of the lightweight frame is that it has a lower weight capacity than other power towers. The Body Champ will hold a maximum of 250 lbs (113 kgs), whereas others often go up to 350 lbs (158 kgs). That said, 250 lbs is nothing to sneeze at, and it’s very unlikely that this thing will break or bend. Another thing that gives away the lower quality of the materials is the fact that when assembling it, you’ll likely find that a few of the holes on the frame don’t line up, making it hard to screw / bolt them together. This is most likely due to minor errors in the manufacturing process, and will probably show up when inserting the smaller support crossbar (assembly step 2). It will work, but you may have to give it some elbow grease to get the holes lined up enough to get the Hex Bolts through. Other than the lightweight steel and the possible minor defects caused by the manufacturing process, the rest of the materials are reasonably good quality. The grips on the pull up bar, dip bar and VKR handholds are nice and comfortable, as are the additional grips on the straight portion of the pull up bar. The arm rests and back rest are well-padded and covered in good, double-stitched vinyl. So, the design of the Body Champ Power Tower is very good, and the quality of the materials is pretty good. Overall, it has features that will suit some people, and not others, as is the case with most pieces of exercise equipment. But, how easy is it to put together? All-in-all, the Body Champ Power Tower has a very straightforward assembly process. The instructions are simple and easy to read, and the whole thing shouldn’t take you more than about 90 minutes to put together. As with all pieces of equipment like this, we recommend having someone to help you assemble it, but it won’t be a major problem if you have to do it alone. 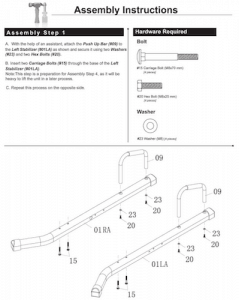 There are quite a lot of nuts and bolts that come with this equipment, so you’ll save yourself some time and potential frustration if you gather all of the parts, especially the hex bolts and washers, and sort them into piles according to the assembly manual. If you have a socket set, this will come in handy and an adjustable wrench is also a must. Always wait until you have the power tower fully assembled before completely tightening all the bolts. This applies to almost all fitness equipment that requires assembly, and will ensure that it is level. Most people will have very little trouble using the Body Champ Power Tower to get a good quality workout. The one issue we have with it concerns the width of the dip bars and arm rests. They are 24 inches apart, putting them amongst the widest of all power towers (the only power tower that has wider dip bars and arm rests is the Body Vision PT600, measuring 25 inches apart). 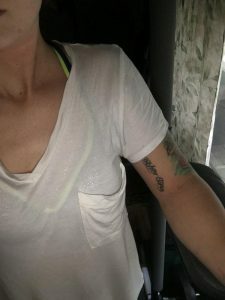 What this means is that people with narrow shoulders (i.e., shorter and / or slimmer individuals) won’t be able to have their arms pulled tight against their body when doing dips and knee raises, which can put extra stress on the shoulders and cause discomfort. There’s not really much you can do about it either. If you have weak or injured shoulders, we’d recommend going with a more narrow power tower. The Xmark XM-4434 has the narrowest dip bars and arm rests (21 inches), and may be a safer option for you. As previously mentioned, this power tower IS NOT suitable for doing advanced bodyweight movements like muscle-ups or front levers, and it’s certainly not suitable for doing kipping pull ups (i.e., the crossfit style pull ups). If you do controlled pull ups and dips, you should feel very little wobble or instability, however if you’re concerned about it, place some weights or a couple of sandbags on the base. Finally, as with most power towers, you need to be mindful of how tall they are and how high your ceilings are. The Body Champ Power Tower is one of the shorter power towers in its range, but it still stands approximately 6 feet 11 inches tall at it’s highest point (which is the pull up bar). Therefore, you’ll need at least 8 ft ceilings in order to do pull ups without hitting your head. Put simply, the Body Champ only offers really good value for money when it’s on sale. When not on sale, it can be $200+, which is too much for this power tower. If you can get it for less than $150, then it will be a fantastic investment in your health, fitness and physique. 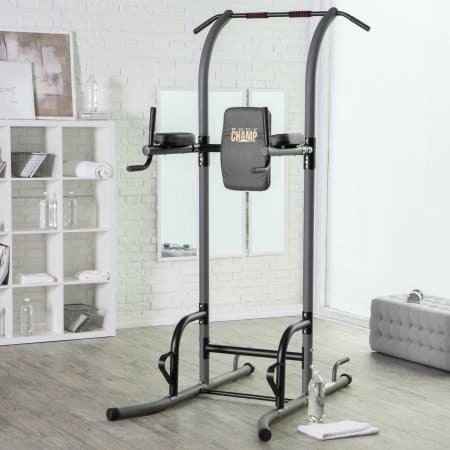 Overall, the Body Champ Power Tower is a good piece of equipment that will give you a very solid upper body and core workout, and make a nice addition to any home workout space. It offers as good a range of exercises as most other similar power towers, it’s well-designed even if the quality of the materials isn’t the very best, and it’s very simple to put together and begin using. If you’re looking for a power tower that is nice and stable, and can be moved around easily, then the Body Champ is ideal. Just make sure to wait until it’s on sale before purchasing it. 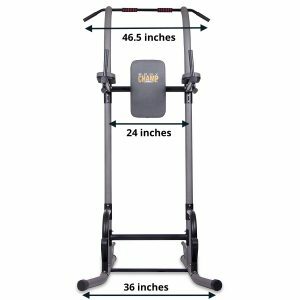 If you’re still interested in the Body Champ 4-Station Power Tower, you can check the current price here. Thanks for reading the review. If you liked it enough to get right to the end, then please consider sharing it with your friends. Also, leave any comments or thoughts you have in the comments section below.